L’exercice de pressions à la hausse des testicules. A number of Louisiana legislators are feeling increasing heat back in their districts about why Louisiana continues, year after year, to have the highest insurance rates in the nation. A small deep southern state should be way down the list of most expensive states. That’s the case across the board in states from Texas across the gulf coast and up the eastern seacoast to North Carolina. Property insurance is somewhat higher because of the proximity to the hurricane prone gulf. But no state, in the south or elsewhere across the country, continues to have such high, across the board insurance costs. So legislators, for good reason, are wondering: Why? In the coming weeks, a joint legislative committee on insurance, made of insurance committee members from both the House and the Senate, will begin a series of hearings to try to make sense of why the present insurance climate is so out of whack. The hearings at the state capitol in Baton Rouge will convene beginning in the middle of March and continue through the spring legislative session. State Senator Troy Hebert from South Louisiana, and Representative Chuck Kleckley from North Louisiana, will head up this joint effort. 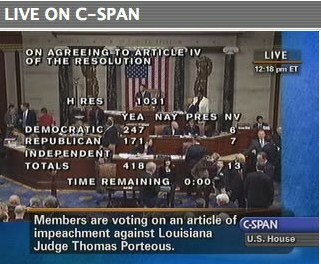 The U.S. House of Representatives is scheduled to vote today on whether to impeach New Orleans U.S. District Judge Thomas Porteous. On Jan. 27, the House Judiciary Committee unanimously approved four articles of impeachment against Porteous, accusing him of taking money, expensive meals and other gifts from lawyers and a bail bond company with business before him and making false statements in a personal bankruptcy filing. Porteous, 63, continues to receive his $174,000 federal judicial salary, but has been barred from hearing cases until September 2010. If the Senate doesn’t vote to remove him from office or he doesn’t resign, Porteous would be able to resume hearing cases in September. Anyone else wondering how much more will we learn about his “improper conduct” as a state judge as the story of corruption in Jefferson Parish unfolds? Folks I could be wrong but methinks this is known in polite society as exercer une pression sur les testicules. We don’t bite so if someone should be moved to make an official appearance we’re all ears. The following just in from team Vandenweghe. While Liberty Mutual’s and Standard Fire’s motions to sever have been pending, the Branch docket has had a severe case motion sickness. Judge Vance offered the cure in short order in what is a really short Order denying both motions as “premature”. A typical Sarah Vance Order is detailed and lengthy – and this one is neither. When I read it the first time, I thought it would just take a few minutes to compose this post; but, then, I read it again and that was hours ago and this is my fourth sentence. Obviously, I’ve done more thinking than writing. Is it short and lacking in detail because it would be “premature” to say more or is she deliberately guarded? There appear to be at least one or more common issues of law or fact in this action that warrant consolidation under Rule 42 of the Federal Rule of Civil Procedure, at least in the pretrial phase of this case. See FED. R. CIV. P. 42(a) (“If actions before the court involve a common question of law or fact, the court may . . . consolidate the actions.”).